These clear plastic shaker bottles feature black screw on caps with convenient carry handle, colorful lid that snaps tight to secure your contents, and matching color weighted mixer that makes blending your protein supplement that much easier. Select from options that include white, lime green, bright pink, red and blue, and get custom printed with the name of your nutrition store or gym. 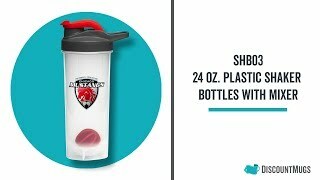 Our custom plastic shaker bottles hold up to 24 ounces of your preferred drinks, and are printed with your full color logo for great giveaways you can pass on to your clients during your grand opening or promotional event. Order today to take advantage of our Free Shipping offer on select orders. Fast shipping! Product came as designed and looked great. Thank You! Awesome Product & the printing looked great! Great price, Fast Shipping... Thanks!